An awesome video provided by “Farid HQ” YouTube channel. I can safely say that this has to be one of the most beautiful live performances ever by any singer around the world, really without exaggerating. It’s worth listening to it whether you are a singer, a musician, or just a music lover. The vocal embellishments that Farid does along the song, the improvisations and the modulations through different modes and scales, and all the other beautiful details, are simply out of this world. This entry was posted in General and tagged Farid, live, wayyak on January 25, 2019 by Farid. In the Arab world, Mother’s Day is celebrated today, March 21 which is the spring equinox. Listen to Farid El Atrache singing Fayza Ahmad’s song Sitt el Habayeb ست الحبايب (composed by Abdel Wahab) during a radio interview. This entry was posted in General, Songs and tagged Abdel Wahab, Farid, Fayza, Mothers day, radio interview on March 21, 2017 by Farid. I will be looking for administrators of this website soon. So if you think you may have some time on you and if you’re a big fan of Farid, you may contact me or just leave a comment below this post. Once there is some good content on the website, I’ll probably assign different people to write on the blog and manage the content. This entry was posted in General and tagged admin, funny on February 24, 2017 by Farid. Farid El Atrache Website is going back online! 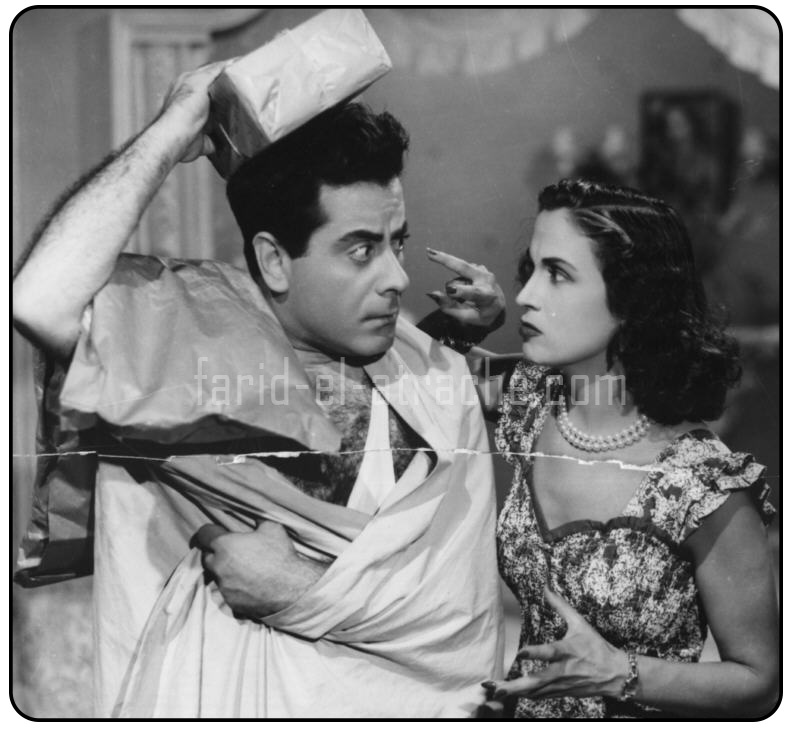 After going offline for more than 12 years, Farid-el-atrache.com is going to be back online soon. 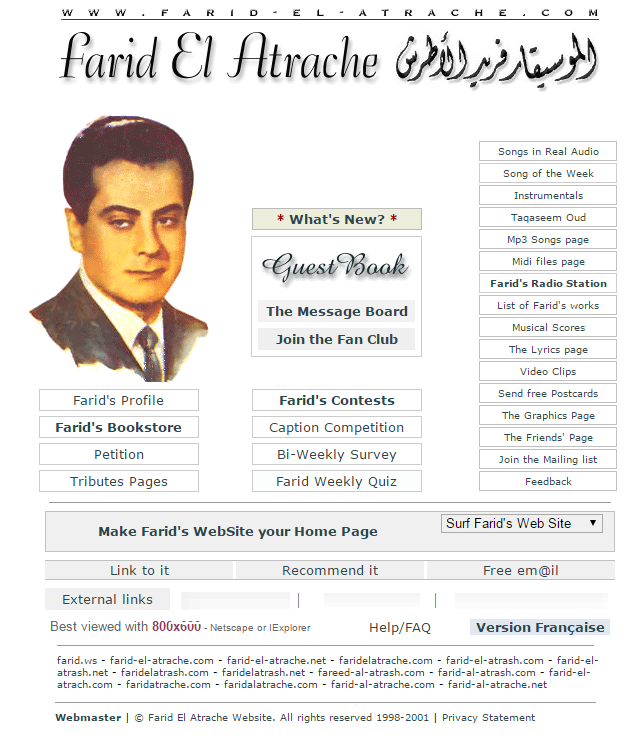 Farid-el-Atrache.com was initally launched in 1998. After a short while, it became an extremely popular website with hundreds of regular fans coming back to visit it everyday. It was featured several times on TV and in newspapers and at some point it was one of the most visited arabic websites on the internet. After many years of success, maintaining the website became an overwhelming daily task requiring a huge amount of my time. With the intention of making it a better website, I decided to put it offline for a short while, while I re-program it, but then the opportunity to bring it back online never arose. Now I’m planning to make things simple by bringing it back online as a blog, which should be easy to update on a regular basis. …I will see you soon Farid’s fans. This entry was posted in General on November 28, 2014 by Farid.